There’s no question that, in the modern landscape, a big part of your marketing strategy is digital. Consumers and businesses alike are almost always online — and you want to be able to reach them and observe their behavior where they spend the most time. We’ve compiled a list of seven digital marketing strategies that marketers can adapt to help their teams and businesses grow, as well as a crash course on the meaning of digital strategy and marketing campaigns. Then, grab your free collection of digital content marketing templates at the end of this post. Your digital marketing strategy is the series of actions that help you achieve your company goals through carefully selected online marketing channels. These channels include paid, earned, and owned media, and can all support a common campaign around a particular line of business. The term “strategy” might seem intimidating, but building an effective digital strategy doesn’t need to be difficult. Depending on the scale of your business, your digital marketing strategy might involve multiple digital strategies — each with different goals — and a lot of moving parts. But coming back to this simple way of thinking about strategy can help you stay focused on meeting those objectives. Despite our simplification of the term “strategy,” there’s no doubt it can be difficult to get started actually building one. Let’s see what a digital marketing campaign looks like, and then, we’ll jump into those seven building blocks to help you create an effective digital marketing strategy to set up your business for online success. It’s easy to confuse your digital strategy with your digital marketing campaigns, but here’s how to distinguish the two. As we’ve already outlined, your digital strategy is the series of actions you take to help you achieve your overarching marketing goal. Your digital marketing campaigns are the building blocks or actions within your strategy that move you toward meeting that goal. Here a few other well-known examples of digital marketing campaigns and the strategies they employ. GoPro is famous for its incredible point-of-view style action footage, all taken from the company’s classic fisheye lens. What you might not know is that so much of the video content you see on its YouTube channel wasn’t made by GoPro, but rather by its most loyal users. By populating its YouTube channel with user-made video content, GoPro has encouraged an entire fanbase of outdoorspeople to take amazing footage of their adventures and post it online — often with credit back to GoPro. This ongoing digital marketing campaign has championed the use of video to spread the word about the GoPro product line — and a lot of the content is created by the customers themselves. Check out the video below, which GoPro republished, awarding the video’s original shooter with being one of the best videos in its category. You wouldn’t think of an airline as a leader in creative digital marketing, but don’t underestimate the stories they can tell on social media (emphasis on “stories”). Delta Air Lines is a prolific user of social media, specifically on its Twitter handle. The brand uses this account to engage potential passengers in a variety of ways that are both timely and emotionally stimulating. Last month, in honor of Breast Cancer Awareness Month, the company began sharing personal stories from Delta employees directly through the company’s Twitter feed. Here’s the beginning of one story’s thread, below. In honor of Breast Cancer Awareness Month, we’re sharing the stories of the survivors and fighters of our Delta family. All you need to hear is the word “Geico” to remember you can save 15% or more on your car insurance. But even a company with such a memorable tagline can risk annoying its buyers if its marketing campaign is too longwinded. That’s why Geico launched a series of preroll ads on YouTube that admit to the ad’s brevity in the videos themselves. Wayfair, a home furnishings and decor merchant, has a truly innovative Instagram strategy. Let’s just say its photos aren’t just photos. Instagram gives companies an opportunity to show their followers a more intimate side of the brand, lifting the curtain on the business to show off the employees and events that make the organization what it is. For Wayfair, however, Instagram isn’t just a culture play — it’s a purchase page. 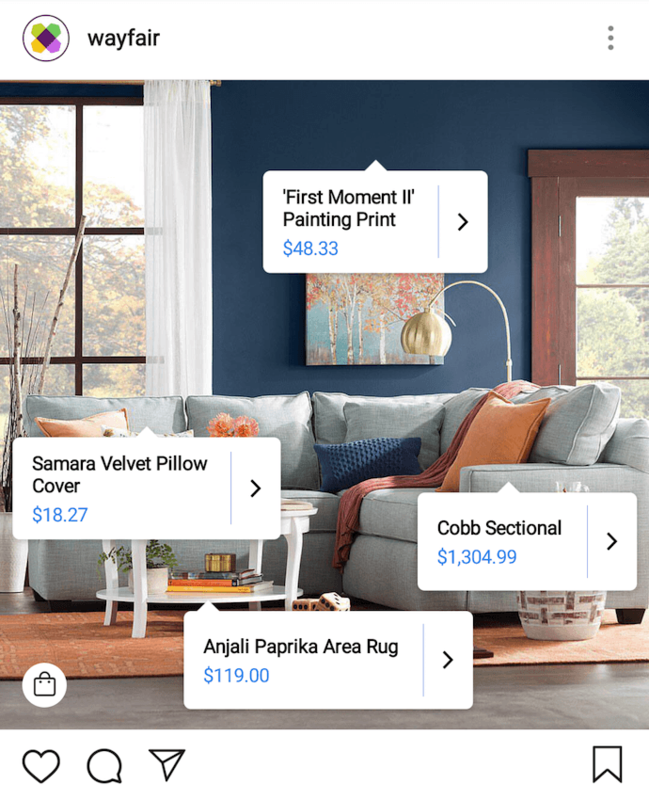 Using Instagram’s product tags, Wayfair has taken some of its prettiest home interior shots on Instagram, and tagged them with product and price labels. It’s a digital marketing campaign that shows people exactly how much each item in the photo costs, helping Wayfair generate buyers right from its Instagram account. Check out an example, below. Mastercard bases its brand on the stories and adventures that cardholders go on. But what good is a travel-based brand without a travel-based digital marketing campaign to go with it? Priceless Cities, Mastercard’s travel blog, gives readers a travel resource to go along with the credit cards that help pay for these readers’ destinations. It’s a pretty good idea, as it allows the company to better align itself not just with the things its customers buy, but with the places its customers go. Check out the blog here. ETF Securities is a small, asset management service based in Australia catering to wealth managers and investors in Europe. Because the service they provide is so complex, the company found where its customers hung out the most — LinkedIn — and sponsored paid content on this platform that drives more interest in investments and helps customers make smarter financial decisions. With this digital campaign, ETF Securities saw 95% year-over-year growth in its LinkedIn followers. Red Bull has become more well known for its sponsorship of extreme sports than the energy drink it sells. It’s a natural fit for the types of people the drink appeals to. 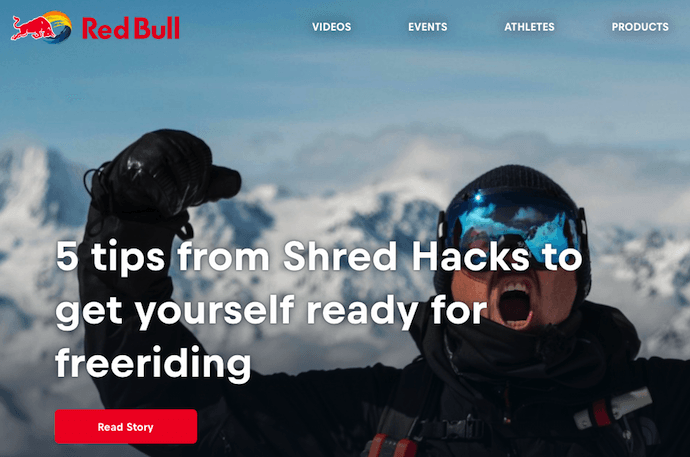 But instead of creating digital content on the energy drink industry, Red Bull captures its audience with articles and videos all about the latest happenings in the extreme sports community. In this digital marketing campaign, Red Bull teaches us that what you sell isn’t always the ideal content strategy. Rather, it’s the lifestyle that your customers live. Check out the company’s website here. It’s important to note that even if a campaign runs over the course of a couple of years, it doesn’t make it a strategy — it’s a tactic that sits alongside other campaigns to support a larger marketing strategy. For example, ETF Securities (cited above) hosted a campaign to increase its followers on LinkedIn, using the digital strategy of sponsored content (a form of paid media). This one strategic campaign might be one small part of a larger digital marketing strategy that serves to generate more leads for one of its products or business lines. Now that we’ve gotten to grips with the basics of digital strategy and digital marketing campaigns, let’s dig into how to build your strategy. Identify your goals and the digital marketing tools you’ll need. Evaluate your existing digital channels and assets. Audit and plan your owned media campaigns. Audit and plan your earned media campaigns. Audit and plan your paid media campaigns. 1. Build your buyer personas. Buyer personas represent your ideal customer(s) and can be created by researching, surveying, and interviewing your business’s target audience. It’s important to note that this information should be based upon real data wherever possible, as making assumptions about your audience can cause your marketing strategy to take the wrong direction. To get a rounded picture of your persona, your research pool should include a mixture of customers, prospects, and people outside your contacts database who align with your target audience. But what kind of information should you gather for your own buyer persona(s) to inform your digital marketing strategy? That depends on your businesses, and is likely to vary depending on whether you’re B2B or B2C, or whether your product is high cost or low cost. Here are some starting points, but you’ll want to fine-tune them, depending on your particular business. Location. You can use web analytics tools like Google Analytics to easily identify what location your website traffic is coming from. Age. Depending on your business, this may or may not be relevant. It’s best to gather this data by identifying trends in your existing prospect and customer database. Income. It’s best to gather sensitive information like personal income in persona research interviews, as people might be unwilling to share it via online forms. Job Title. This is something you can get a rough idea of from your existing customer base, and is most relevant for B2B companies. Goals. Depending on the need your product or service was created to serve, you might already have a good idea of what goals your persona is looking to achieve. However, it’s best to cement your assumptions by speaking to customers, as well as internal sales and customer service representatives. Challenges. Again, speak to customers, sales and customer service representatives to get an idea of the common problems your audience faces. Hobbies and interests. Speak to customers and people who align with your target audience. If you’re a fashion brand, for example, it’s helpful to know if large segments of your audience are also interested in fitness and well-being, as that can help inform your future content creation and partnerships. 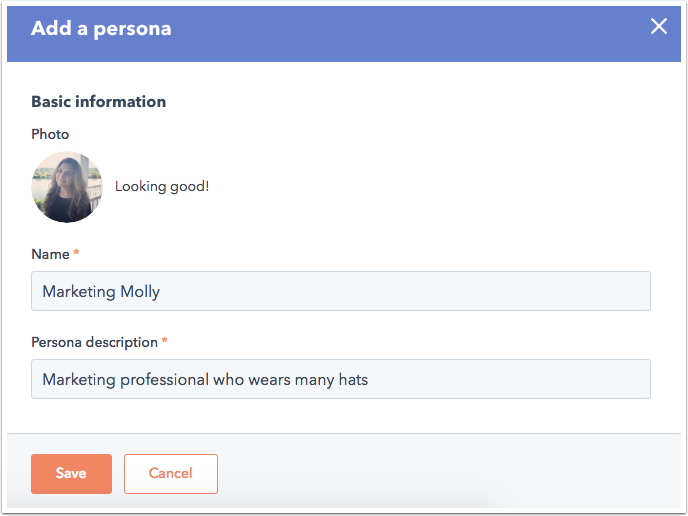 Take this information and create one or more rounded personas, like Marketing Molly below, and ensure they’re at the core of your digital marketing strategy. 2. 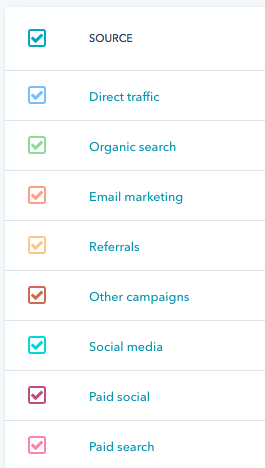 Identify your goals and the digital marketing tools you’ll need. Whatever your overarching goal is, you need to know how to measure it, and more important, actually be able to measure it (e.g., have the right digital marketing tools in place to do so). How you measure the effectiveness of your digital strategy will be different for each business and dependent on your goal(s), but it’s vital to ensure you’re able to do so, as it’s these metrics which will help you adjust your strategy in the future. 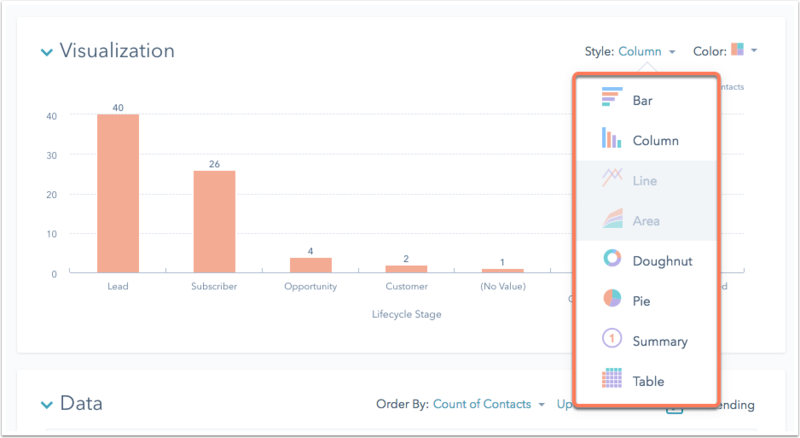 If you’re a HubSpot customer, the Reporting add-on in your HubSpot software brings all of your marketing and sales data into one place, so you can quickly determine what works and what doesn’t. 3. Evaluate your existing digital channels and assets. When considering your available digital marketing channels or assets to incorporate into your strategy, it’s helpful to first consider the bigger picture to avoid getting overwhelmed. The owned, earned, and paid media framework helps to categorize the digital ‘vehicles’, assets, or channels that you’re already using. Quite simply, earned media refers to the exposure you’ve earned through word-of-mouth. Whether that’s content you’ve distributed on other websites (e.g., guest posts), PR work you’ve been doing, or the customer experience you’ve delivered, earned media is the recognition you receive as a result. You can earn media by getting press mentions, positive reviews, and by other people sharing your content on social media, for instance. Gather what you have, and categorize each vehicle or asset in a spreadsheet, so you have a clear picture of your existing owned, earned, and paid media. Now you know what’s already being used, you can start to think about what to keep and what to cut. 4. Audit and plan your owned media campaigns. At the heart of digital marketing is your owned media, which pretty much always takes the form of content. Every message your brand broadcasts can generally be classified as content, whether it’s your ‘About Us’ page, your product descriptions, blog posts, ebooks, infographics, or social media posts. Content helps convert your website visitors into leads and customers, and helps to raise your brand’s profile online — and when it’s optimized, it can also boost any efforts you have around search/organic traffic. Whatever your goal, you’re going to need to use owned content to form your digital marketing strategy. To build your digital marketing strategy, you need to decide what content is going to help you reach your goals. If your goal is to generate 50% more leads via the website than you did last year, it’s unlikely that your ‘About Us’ page is going to be included in your strategy — unless that page has somehow been a lead generation machine in the past. The idea here is to figure out what’s currently working, and what’s not, so that you can set yourself up for success when planning future content. Identify gaps in your existing content. Create a content creation plan. 5. Audit and plan your earned media campaigns. You can get this information from tools like Google Analytics, or the Sources Reports in your HubSpot software. You might find that a particular article you contributed to the industry press drove a lot of qualified traffic to your website, which in turn converted really well. Or, you might discover that LinkedIn is where you see most people sharing your content, which in turn drives a lot of traffic. The idea here is to build up a picture of what earned media will help you reach your goals, and what won’t, based on historical data. However, if there’s something new you want to try, don’t rule that out just because it’s not yet tried and tested. 6. Audit and plan your paid media campaigns. By the end of the process, you should have a clear idea of which paid media platforms you want to continue using, and which (if any) you’d like to remove from your strategy. 7. Bring it all together. In January, you might start a blog which will be continually updated once a week, for the entire year. In March, you might launch a new ebook, accompanied by paid promotion. In July, you might be preparing for your biggest business month — what do you hope to have observed at this point that will influence the content you produce to support it? In September, you might plan to focus on earned media in the form of PR to drive additional traffic during the run-up. By taking this approach, you’re also creating a structured timeline for your activity, which will help communicate your plans to your colleagues — not to mention, maybe even help keep you sane. If you’re eager to build a truly effective strategy to help grow your business, check out our free collection of content marketing templates below.